Tomorrow’s Inside Xbox is going to be a big one – we already know Microsoft is going to reveal their E3 2019 plans during the show, but it seems they may be unveiling some new hardware as well. 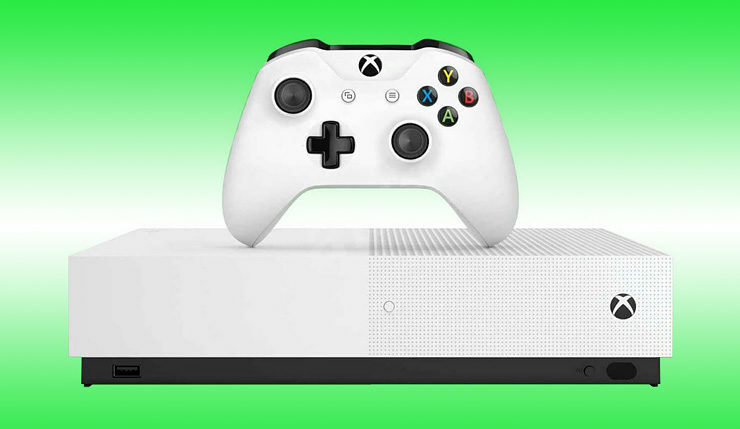 There have been rumors Microsoft is prepping a disc-less Xbox for a while, and apparently the new console has already begun popping up in some retailers’ databases. 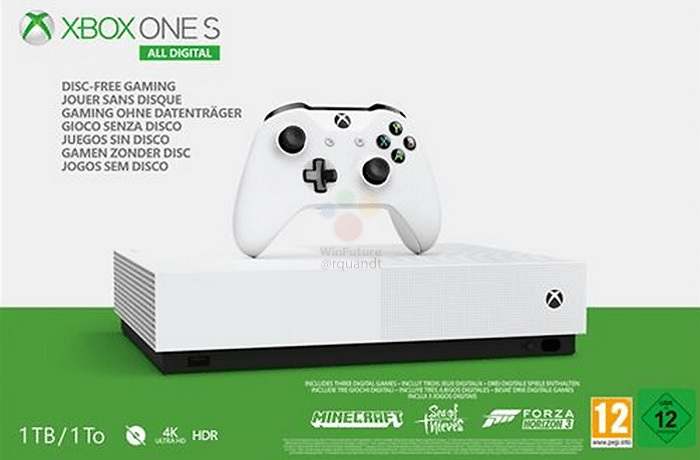 In fact, German site Winfuture managed to get their hands on a promotional image for the Xbox One S All-Digital console. Check it out, below. As you can see, the console looks very much like a standard Xbox One S, with one big difference – no slot for a disc! As we’ve heard before, It seems the all-digital console will have a standard 1TB hard drive and come with Sea of Thieves, Forza Horizon 3, and Minecraft pre-loaded. Apparently, this bundle will cost €229, or around $260, which seems a bit expensive. Sure, you’re getting three games with system, but why bother picking up the discless Xbox One if a hefty discount isn’t part of the bargain? $260 is more than most standard Xbox One S bundles cost! Of course, consoles are often more expensive in Europe – perhaps North American gamers will get a better deal. Our hour-long April episode will explore some exciting Xbox Game Pass news, new details on the much anticipated Anniversary Update for Sea of Thieves, special guest Rod Fergusson from The Coalition, first details and footage of the Warhammer Chaosbane beta, an exclusive look at Rage 2, a handful of exciting backward compatibility announcements, and several surprises we’re saving for the show itself. The Xbox One S All-Digital console is rumored to launch on May 7. What do you think? Would you be willing to pick up a disc-less console or do you just not see the appeal?